In the last post, I talked about how I select and modify recipes to match my equipment, process, and efficiency. I also talked about how, before I start to brew, I clean, measure, and arrange everything so that the actual brew goes as smoothly as possible. In this post, we're going to look at the mash process and how I typically do it. My brew day sheet tells me how much mash and sparge water I've calculated that I will need based on the grain bill and equipment. I begin by filling The Grainfather with the mash water and dropping in a Campden tablet to remove chlorine and chloramine. I fill my sparge water kettle with the sparge water amount, plus one gallon to account for dead space in the Mega Pot kettle. When The Grainfather has reached the mash temperature (or the temperature of the first step in a multi-step mash), I begin scooping in the crushed grain. Every few scoops, I stir the grain with the stainless steel spoon you see in the photo above. This ensures that all the grain gets wet and participates in the mash. Once it's all in, I place the mesh top on the grain basket and try to get it as close as I can to the top of the grain bed without compressing the grain bed. With the grain basket now loaded, I place the overflow cap on the pipe in the grain basket, drop in a tablespoon of pH 5.2 Stabilizer, put on the glass lid, attach the recirculation pipe, and start the recirculation pump. 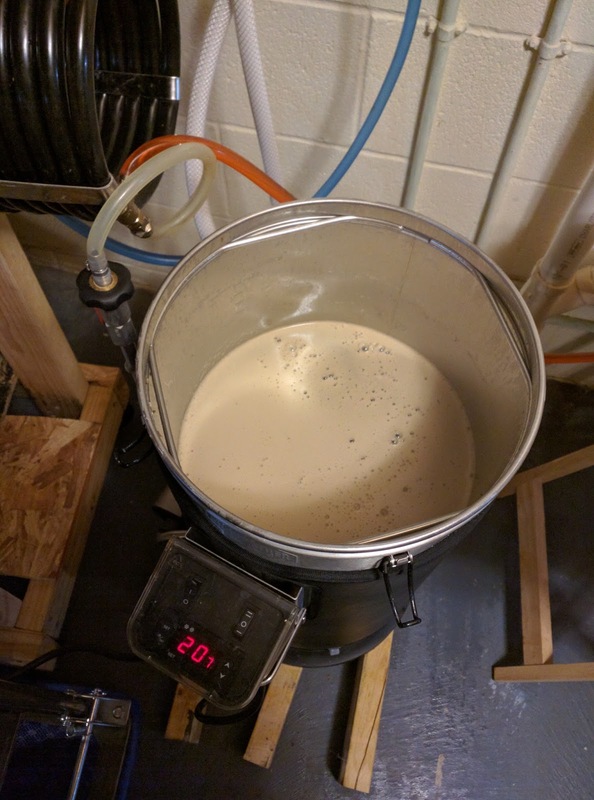 I usually stick around for a few minutes after this, as occasionally the pump will have trouble priming itself or the wort may not flow smoothly through the grain bed. When this happens, wort will start dripping out through the fitting where the recirculation pipe connects to the valve on the side of The Grainfather. This dripping can make quite a mess if left unattended. As I work, I check off items and steps on the Brew Day Sheet. With about 30-40 minutes left in the mash process, I'll turn on the induction cooktop to begin heating the sparge water to the necessary temperature. When it's time to mash out, I'll have The Grainfather raise the mash temp to 167F and give it about 10 minutes at that temperature. 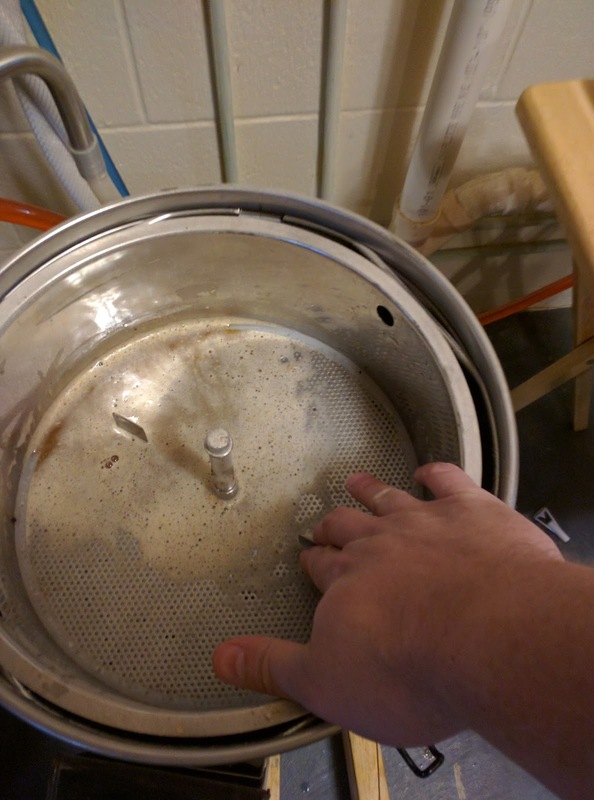 I lift out the grain basket and move the silicone hose from the sparge water kettle into the grain basket. While the sparge is underway, I set the controller to raise the kettle temperature to 200F. This gets it close to boil temperature while the sparge completes. When sparging is finished, I lift off the grain basket and quickly put it inside a 5-gallon kettle I have which is wide enough to hold the basket easily. This kettle holds the remaining drips from the grain basket and prevents a mess on the floor while I get the kettle up to a boil. Now I set the switch on the controller to "boil" mode. I usually take the time to scoop the spent grain out of the basket while the kettle heats to boiling. Then I rinse off the grain basket with clean hot water from a nearby sink so that cleanup will be easy later. The spent grain is set out of the way until the boil is finished. It will be disposed of later. The 5-gallon kettle gets rinsed also. At this point, I clean my stainless steel spoon and stir the wort vigorously. I use a pipette to capture a few drops of the wort and drip those on my refractometer to take a pre-boil gravity reading. If I'm using a recipe that includes only grain and hops, this reading should match up to the figure on the brew day sheet if the volume is also correct. If it's off, this is when I'll decide if I'm going to need to increase the boil time (to concentrate the wort and increase its gravity), add water to reduce the gravity, or add sugar or malt extract to raise it. Often, while sparging or during the boil, I'll mix up some Star San in my fermenter and begin sanitizing the fermenter for use. I'll also sanitize an airlock and fill it with sanitizer so it's ready, too. This saves time later on. My wort is now ready for the next step in the process, the boil. We'll discuss that next week. 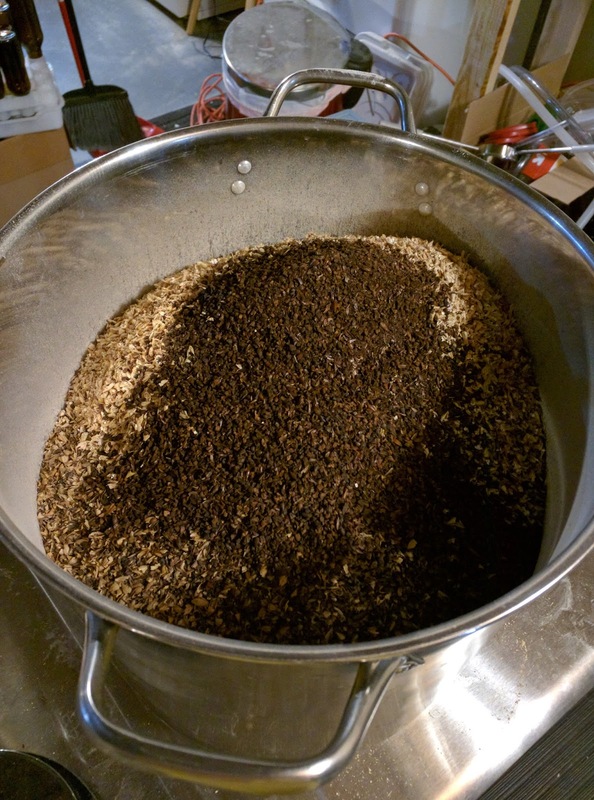 A couple of homebrewing friends have asked me about my process. They want to know how I go from a recipe to a finished beer, the steps I follow, why I follow them, and the tools I use. This post is an attempt to capture and share all the information. It's important to note that my process changes a bit as I learn new things, gain new equipment, or discover better or easier ways to do things. Consider this post a "snapshot" of my process and equipment as it stands right now. Six months from now it could be different. iMake's The Grainfather RIMS brewing system: This handles mashing, boiling, and chilling of the wort. I also added the Graincoat accessory to reduce heat loss and speed up kettle heating time. An induction cooktop and Mega Pot 1.2 kettle: This provides heated sparge water. 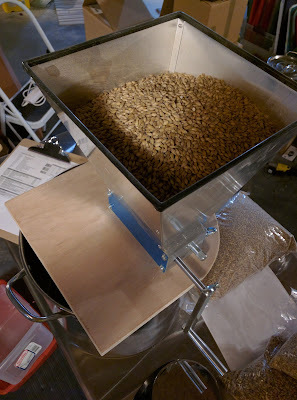 I have it on top of a tall table, at a height that I can open the valve on the kettle and have sparge water flow down a silicone tube into The Grainfather's grain basket for sparging. A one-gallon plastic pitcher with markings at the quart levels: I use this for various things, including measuring mash and sparge water, catching drops from hoses, etc. A long stainless steel spoon: This is used for stirring the grains at the mash step, for stirring ingredients like candi syrup into the kettle during the boil, lifting out hops bags, and other tasks. Miscellaneous plastic containers: These hold grain, spices, hops, and other ingredients. A Kitchen Scale: This weighs grain, spices, hops pellets, and other ingredients as needed. A 5-gallon stainless kettle: This holds The Grainfather's grain basket after sparging until I'm ready to discard the grain and clean it up, preventing sticky messes on the floor. Grain crusher: This allows me to keep my grain as fresh as possible before brewing. Crushed grain will tend to go stale more quickly. I'll typically pair this with the 5-gallon kettle to hold the crushed grain. Refractometer and Pipettes: These allow me to measure the gravity of the wort after the sparge (pre-boil) and after pumping into the fermenter (original gravity). 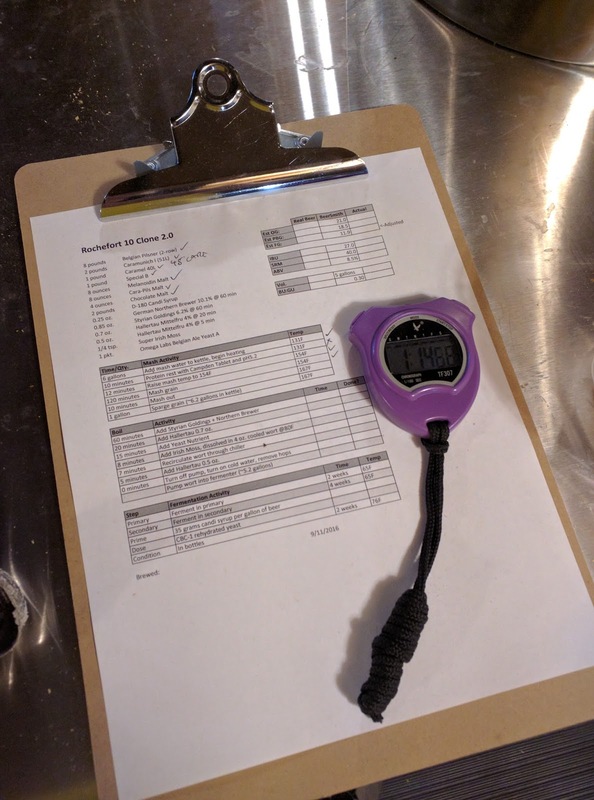 Stopwatch or Brew Timer App on my Phone: This allows me to track mash and boil time, so that I know when to change mash steps or add things during the boil. Hop Spider and hop bag: This allows me to easily add hops during the boil and, if I need to boil longer to reduce the kettle volume, remove the hops to prevent over-bittering. Hand truck: I use this to easily move a full fermenter around the basement. My brewing area and fermentation temperature control systems are on opposite ends of the basement. Hauling a 50-pound fermenter across the distance is a pain. With the cart, it's a simple stroll. SS Brewing Technologies Brewmaster Bucket: This is my fermenter of choice. Its stainless steel design makes cleanup easy and prevents aromas and flavors from one batch affecting a future batch. Its thermowell makes temperature control more precise. Being metal, heat transfer from a fermwrap heater or cooling jacket is better than for a plastic or glass fermenter. Generic terry cloth rags and kitchen towels: I use these to clean and dry things, wipe up spills, etc. They go in the washer after each brew to keep them clean and ready for use. InkBird ITC-310 Temperature Controller: This kicks on a fermwrap heater if my beer is getting too cold, or an aquarium pump submerged in refrigerated water if it gets too hot. The pump pushes water through a Cool Zone cooling jacket wrapped around the fermenter to cool it down from the outside. 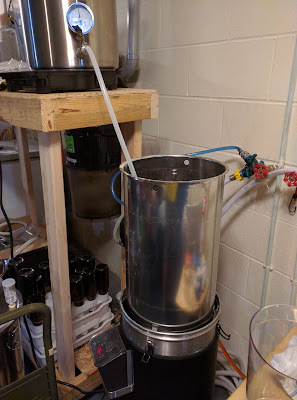 This setup allows me to keep fermentation temperatures within a degree of my target. William's Brewing Rack and Pinion Bench Capper: I have this mounted to a piece of plywood. The design of this capper makes it such that I can easily mix bottles of any size in a batch and cap them without having to "reset" the height of the capper. It also seems to crimp caps very evenly and thoroughly. Igloo Cooler with InkBird ITC-308 temperature controller and fermwrap heater: This combination allows me to place bottles of beer in a temperature-controlled location to aid in carbonation. I typically set the temperature to 76F (depending on the yeast in question) and leave it there for a week or two. This has worked well to carbonate beer. This doesn't cover my labeling process. It all starts with figuring out what I want to brew. Maybe I want to clone a Belgian beer I like, or brew a style I haven't made before. Whatever the case, I need a recipe. Typically, I'll start by looking for recipes that have won medals in national competitions. If I can find one, I'll start with that. If not, I'll check BYO magazine, the American Homebrewing Association (AHA) web site, or other sources to find a starting recipe. 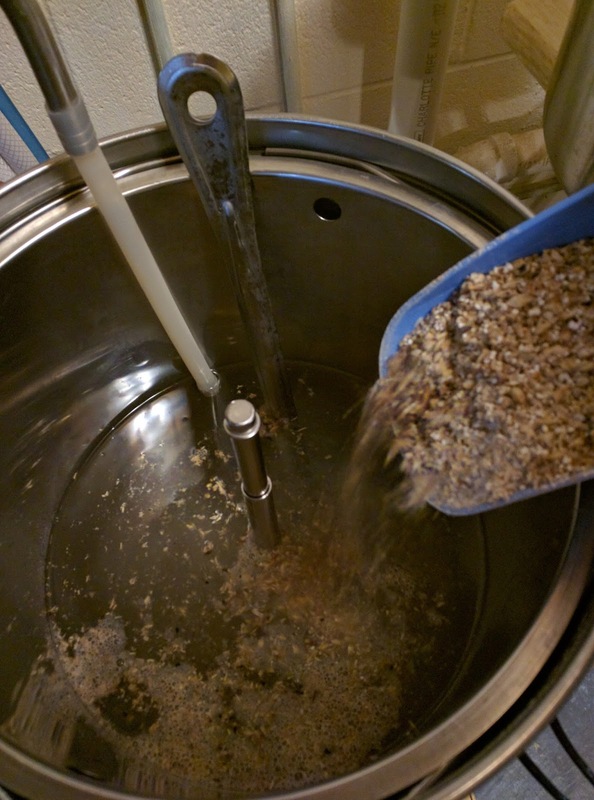 Most published recipes are based on a brewhouse efficiency rating of 75%. They'll also typically list the batch size, original gravity, final gravity, bitterness, and other factors. 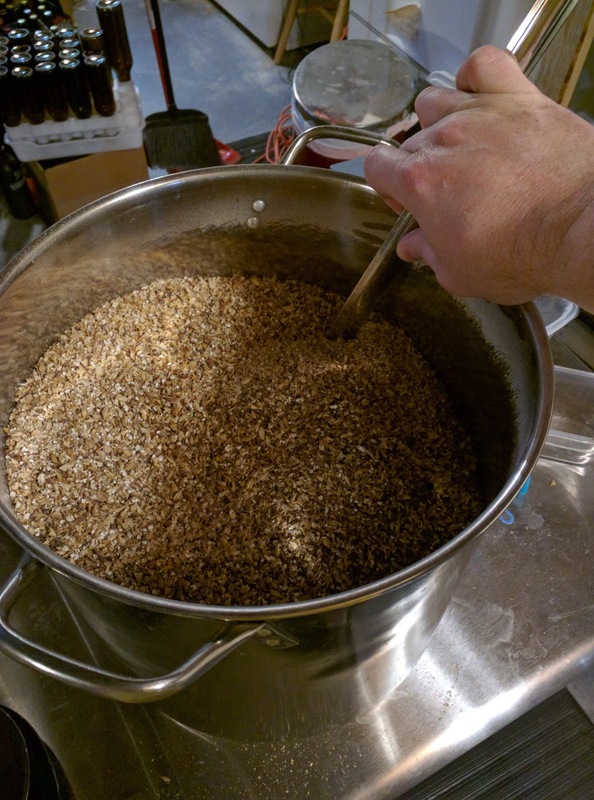 I use the BeerSmith software to help me modify the recipe. I begin by entering the recipe "as is" from the original source. Then, I'll let BeerSmith scale the recipe to a 5.78 gallon batch. Now, I'll start carefully adjusting the amounts downward to account for my 80% brewhouse efficiency, keeping the ingredient ratios as close to the original as possible. Why this combination? I've found through keeping detailed records that it most closely matches the results I get at the end of brewing. I've been able to hit volume and gravity targets within a couple of SG points nearly all the time. Now I have a recipe tailored to my equipment and process. BeerSmith gives me the estimated original gravity, pre-boil gravity, and final gravity. I adjust these figures from standard gravity to Brix, since my refractometer measures in Brix. I'll also use the Refractometer tool in BeerSmith, combined with the original gravity, to reverse engineer the refractometer reading in Brix (for fermenting wort) that will correspond to the expected final gravity of the beer. Now, using a spreadsheet I built for the purpose, I calculate mash and sparge water volumes based on the formula required for The Grainfather. I round these up or down to quarts, to make it easier to measure later on. I'll also tweak the amounts slightly to achieve a 5 gallon fermenter volume. 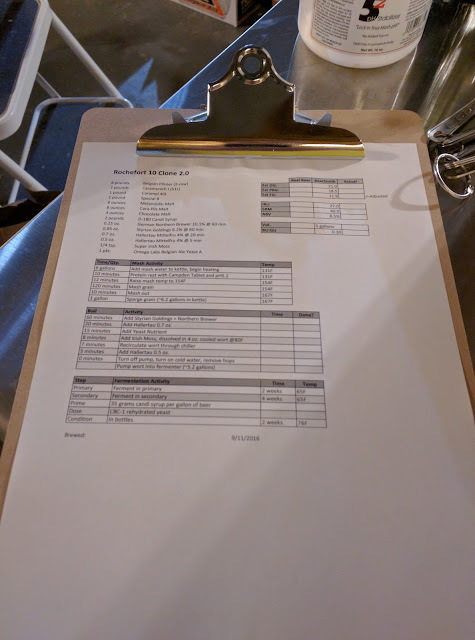 When I'm all finished, I put together a brew day sheet and print it out. I attach it to a clipboard with a pen and take it to the brewing area. I know from past experience that if there's a way I can forget a step, overlook an ingredient, get things out of order, or otherwise mess up a brew day, I'll probably find it. I'll think I have a grain on hand that I don't, or get through the boil only to find I don't have the yeast I thought I did. I've even managed to accidentally spill a key ingredient while measuring it - and have to run out to get more at the last minute. This step is my best effort at preventing the kinds of mistakes I can make that ruin a brew day or make it frustrating. Verify that I have all the ingredients I need to make the beer. Gather them together in one place so that I know where they are. Measure the grain and crush it. I'll also stir all the grain together while it's dry. This seems to help prevent a stuck mash and may make it easier for the enzymes in the base malts to work on the specialty grains. 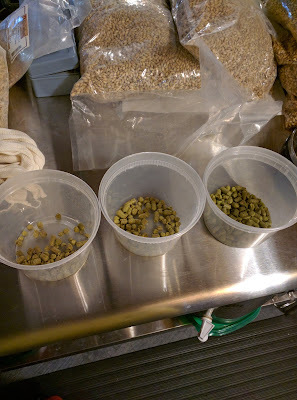 Measure the hops and place each addition in its own bowl or muslin bag. Stack the bowls or arrange them in the order they need to be added. This makes it easy to know what should be added next and track whether you've done it. Clean and sanitize anything you plan to use. Put water in The Grainfather and drop in a Campden tablet to begin removing chlorine and chloramine from it. When absolutely everything is cleaned, sanitized, measured, and set out for use, I'll make one last check and switch on The Grainfather. Based on my brew day sheet, I set the mash temperature. At this point, if I have bags of grain, hops, etc., sitting out that aren't going to be used in this recipe, I'll put those away. Otherwise, I'll have a tendency to procrastinate on that and the brewing area becomes a mess. Brew Day sheet, listing ingredients, mash schedule, boil schedule gravity, etc. A few months ago, I made an attempt to clone the excellent Trappistes Rochefort 10 beer in my Grainfather. The resulting beer turned out well, but had two significant flaws. It had no head when poured into a glass and it was missing a caramel/toffee note that was in the original beer. Since then, I believe I've sorted out the foam/head issues. The original recipe used a high percentage of adjuncts (D-180 candi syrup), relatively low-alpha-acid hops (4% and 6.4%), and probably had yeast that got a bit "tired" after fermenting an 8.5% or higher beer. In this version of the recipe, I've replaced some of the Pilsner malt with Cara-Pils and Melanoidin malts, which I've found produce an excellent creamy head without appearing to affect the flavor of the beer. I also replaced some of the Styrian Goldings hops pellets with German Northern Brewer pellets at 10.1% alpha acid. I'll also bottle the beer with a freshly-rehydrated yeast and priming sugar, which should ensure proper carbonation. All of this combined should produce a well-carbonated beer with a whipped-cream like head on top. At least this worked well in other beers I've brewed recently. The missing note in the flavor was difficult to find, but eventually I noticed it. To provide that missing element, I replaced some of the Pilsner malt with Dingeman's Cara 45 malt. We'll see if that does the trick. If not, a future version will include a different malt. Heated 6 gallons of water in The Grainfather to 154F with a Campden Tablet to remove any chlorine and chloramine from the water. In a separate vessel, heated two gallons of sparge water (only one of which I planned to use). 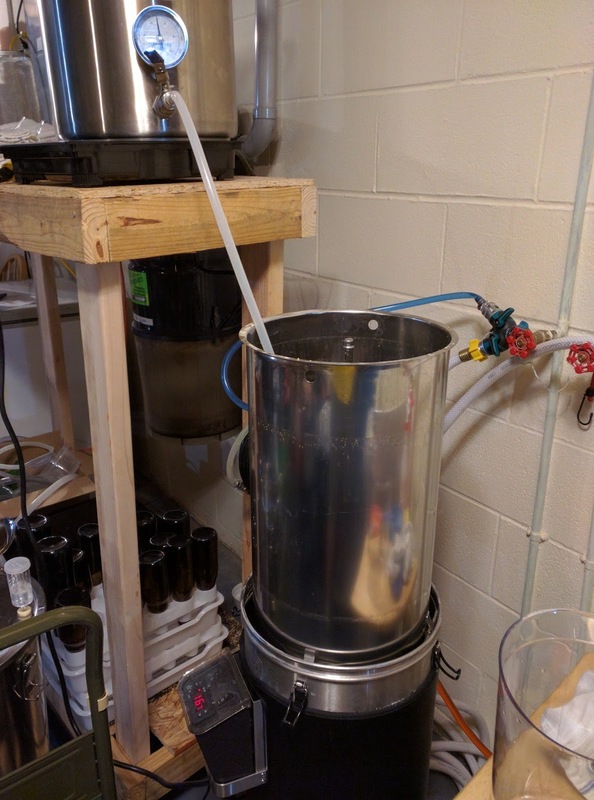 Crushed the grains and stirred them into the mash water, put on the mesh lid, dropped in the pH 5.2 stabilizer, put on the recirculating arm, and turned on the pump. Mashed at 154F for two hours (120 minutes). Heated to mash-out temp of 168F for 10 minutes. Sparged with one gallon of water at 168F. 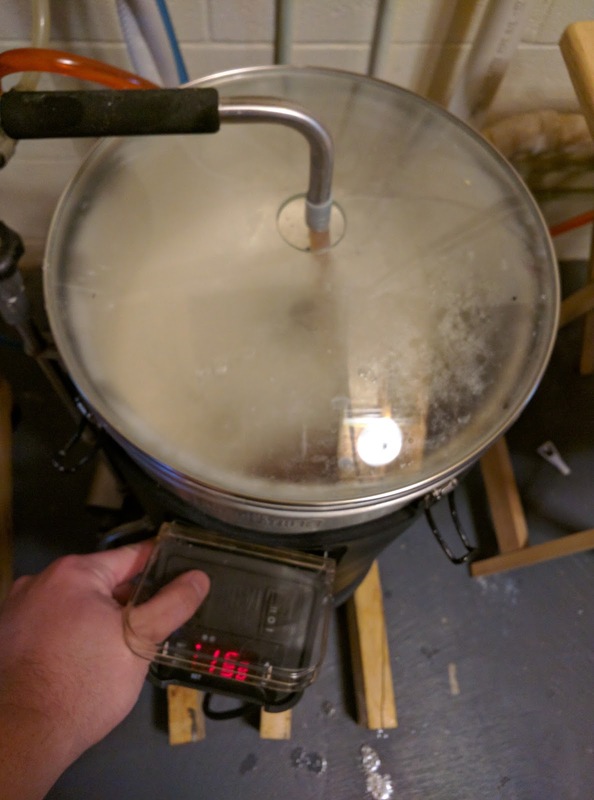 While sparging, turned The Grainfather's thermostat up to 200F so that it would heat toward a boil while I sparged the grain. Checked the kettle volume, which was 6 gallons. Stirred the wort vigorously and checked the pre-boil gravity, which was 1.055 SG or 13.5 Brix. At the completion of sparge, I set The Grainfather's controls to boil. 60 minutes: Added the German Northern Brewer and Styrian Goldings hops pellets in a bag attached to a hop spider. While waiting on the next addition, cleaned and sanitized my fermenter. Also cleaned up other brewing implements I wouldn't be using again. 0 minutes: Turned off the pump and heating element, removed the hop spider after it drained. Whirlpooled a bit more. Turned on the cold water supply to the wort chiller and pumped wort into the sanitized fermenter. Since the wort exited the wort chiller at 83.5F which was too hot for the yeast, I used my fermentation control system to drop the temperature to 70F. At 70F, I pitched the yeast and sealed the fermenter. I've learned that if I want a good yeast flavor profile from a Belgian yeast, it's generally good to just let the yeast ferment at its own temperature. For that reason, I didn't use any temperature control on the fermenter. I left it in my 65-68F basement and let the yeast do its thing. The beer was allowed to ferment for four weeks before bottling. I bottled the beer with 5.4 ounces of corn sugar and rehydrated champagne yeast to ensure carbonation. The bottles spent a week in an insulated temperature-controlled environment at 76F before chilling and serving. Additional time was spent at the basement's ambient temperature of 65-68F. At left you see a finished bottle, labeled and poured into a tulip-shaped glass. As you can see, the beer pours a deep dark brown. There are some reddish notes if you hold it up to a bright light. The head is a nice light brown. It starts somewhat coarse like a cola head, then quickly turns creamy and frothy. It lasts maybe 30-60 seconds. The aroma is a nice mix of dark fruit, leaning toward prune, with caramel and toffee notes. A hint of dark roasted grain and noble hops is in the background. The flavor may make it one of the best things I've ever brewed. Dark fruit from the candi syrup is present but not dominant. Caramel, coffee, and chocolate appear in the middle. The finish is a coffee and hops bitterness that lingers. I have yet to compare this with a real Trappistes Rochefort 10 or even against my version 1.0 recipe, but it holds up extremely well on its own. 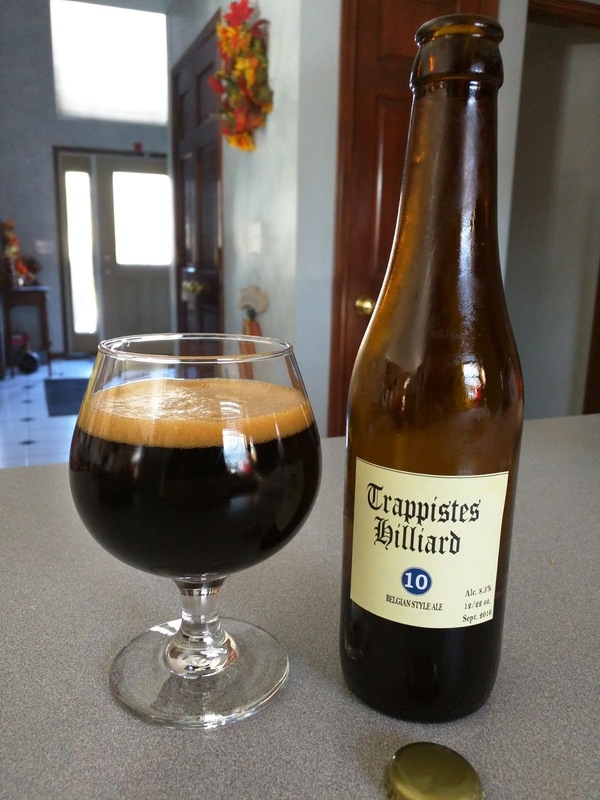 If you enjoy Belgian Strong Dark ales, I don't think you'd be disappointed with this one. It's not cloyingly sweet, and isn't overly dry. The hops bitterness is clear and present, but not overwhelming. It really turned out well. When I brewed this, I learned something new. I've been trying to get my final volume in the fermenter right. I want a full 5 gallons if possible. I've learned that this means that I'll need approximately 5.6 gallons in The Grainfather's kettle after the boil. I'll lose about a quart in the bottom of the kettle, and as the wort chills from boiling to yeast-pitching temperature, it will shrink in size by about 6%. For the first time tonight, I achieved a perfect 5.0 gallon fermenter volume. That isn't what I learned, though. What I learned is that tinkering with the volumes this way without considering the batch size in BeerSmith will knock your pre-boil and original gravity figures off. I calculated all my original numbers for a batch size in BeerSmith of 5 gallons. As a result, I came up low on the gravity - getting 1.077 SG when I expected 1.088. This has a simple explanation and fix. If you adjust the BeerSmith batch size to 5.6 gallons instead of 5.0 gallons (without changing the grain or hops amounts), the estimated original gravity drops to 1.078. Mine worked out to 1.077. So, moving forward, I need to adjust my batch size to 5.6 gallons and tweak grain and hops amounts to account for this increased volume. Then, my fermenter volume should hit 5.0 gallons consistently and my gravity figures should come out right as well. All things considered, I'm quite happy with how this beer turned out. If I changed anything about it, I would possibly swap out a pound of the D-180 with a pound of D-90 candi syrup to punch up the dark fruit flavor. It comes through in the aroma nicely, but isn't quite coming through in the flavor the way I'd like it to. Weyerbacher discontinued their Double Simcoe Double IPA recently, and also released the recipe below. If you like that beer and want to try brewing your own, this recipe should get you on the right track quickly. Note: I know this is a DIPA, but the stated hops amounts at flameout and dry-hop seem awfully high to me. 2.1 oz. Simcoe pellets @ 60 min. This wasn't part of the published recipe, but I'm drawing it from the official specs for the yeast.